I’ve tried doing this on a flatbed scanner and scanning hundreds of photos takes patience (or time) of biblical proportions. Scanmyphotos.com will scan all the photos you can jam into their pre-paid shoebox sized box. The images are processed at 300 dpi, so not archival quality, and are limited to sizes from 3×4 to 8×12. 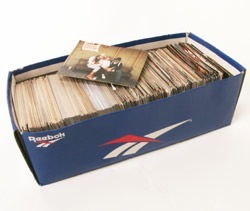 Still, this is a great option if you’ve got tons of old photos around that might be great to share with other family, or that you just want to ensure are protected. They also have options for scanning up to 1000 photos for $49.95, which might be enough for most people.